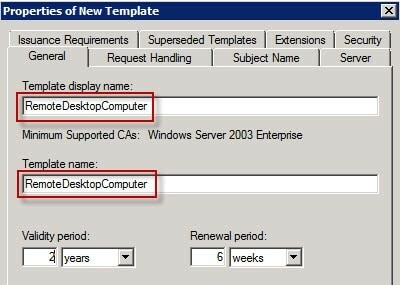 If you manage a Windows Certificate Authority for a Public Key Infrastructure (PKI), then you might run into an issue where some of your servers are using your auto-enroll group policy to request and renew a Remote Desktop certificate twice (or multiple) times per day. Looking in Event Viewer, you might see references to Event ID 64 and Event ID 65 in the Application logs referencing “certificateservicesclient-certenroll”. You’ll see that the certificates get installed successfully, but if you check your issuing Certificate Authority (CA), you’ll also see multiple certificates for that server each time it is renewed. It took some digging, but I finally came across Microsoft KB2531138, which suggests the Remote Desktop certificate template name and certificate template display name don’t match. Sure enough, they didn’t match because one had a space and the other didn’t. If you go to Start > Run and run rsop.msc, look for any errors in your Group Policy, particularly under Computer Configuration\Windows Settings\Security Settings\Local Policies\User Rights Assignment and Computer Configuration\Windows Settings\Security Settings\Local Policies\Restricted Groups. You probably have a policy that is referencing accounts that don’t exist on that server, which is causing it to attempt a Group Policy Update multiple times per day. You’ll need to edit your Group Policy and remove any of those accounts that don’t exist.